Rich in natural minerals and exfoliating elements, sea salt is a luxurious addition to a daily facial care regime. Making your own sea salt facial scrubs is affordable and simple while allowing you to select the ingredients that suit you best. According to author Rosemary Gladstar, using sea salt scrubs for acne may reduce scarring and pitting and can improve circulation for a reduction in breakouts. Many types of sea salt are available, and all work to create a sea salt scrub. However, sea salt purists believe that Dead Sea salts may be the most therapeutic and most likely to promote the desired "salt glow" to your facial skin. To create a salt scrub mixture, combine 1 cup fine ground sea salt, add 1/4 cup extra virgin olive oil and 10 drops essential oil of your choice. Mix this together until it's evenly distributed and lightly moistened with the oil. If the mixture seems too moist, add more sea salt. Put your sea salt scrub mixture in a glass jar with a screw-top lid for later use. According to aromatherapists, essential oils appropriate for skin suffering from acne include chamomile, rose, lavender, ylang ylang and tea tree. Though sea salt is already antimicrobial and therapeutic for troubled skin, adding essential oils to your sea salt facial scrubs increases the benefits of the scrub through increased antimicrobial action. Essential oils also provide aroma-therapeutic elements and increase the enjoyment of the treatment. Keep essential oils away from pets and children to prevent accidental ingestion. When ready to use your sea salt scrub, use a gentle cleanser to wash your face. Allow the scrub to remain on your face for five minutes before rinsing it off with tepid water. Pat it dry and apply 3 drops lavender-infused extra virgin olive oil to facial skin to seal in healing benefits. If irritation occurs, discontinue use. Using any type of exfoliant treatment on skin suffering with acne can increase irritation. 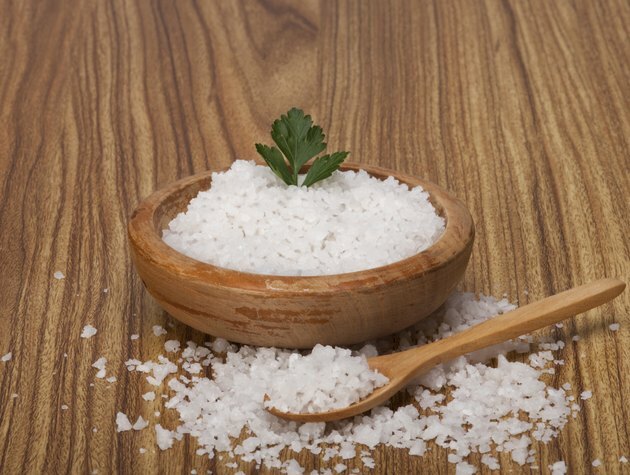 You can decrease the risk of inflammation by gently pressing sea salt preparation onto skin. Pay attention to how your skin responds to any type of sea salt scrub and reduce or increase frequency of treatments based on your assessments. Consult your care provider before using any natural remedy. Apply sea salt scrub to moist skin, gently rubbing in a circular motion to promote adequate exfoliation. Avoid active scrubbing over areas of inflamed acne or mucous membranes.